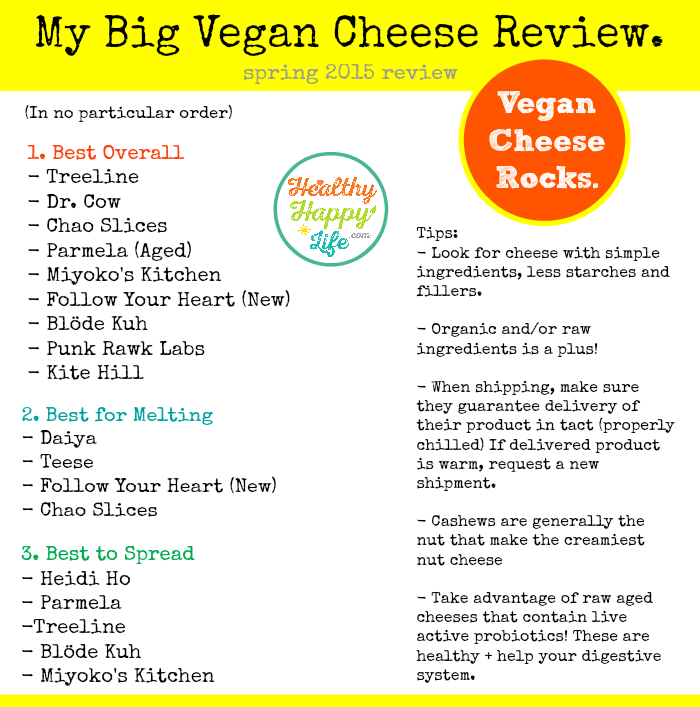 BIG Vegan Cheese Guide + Reviews! 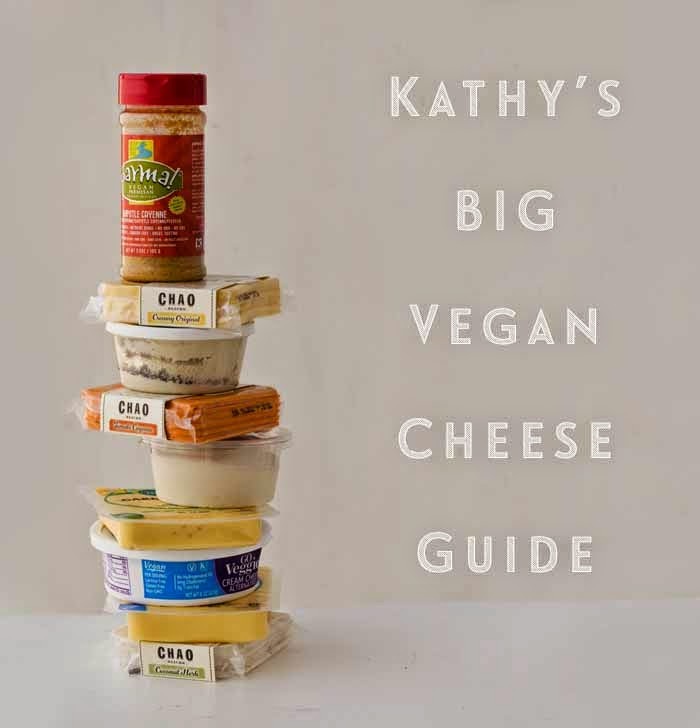 I am SO excited to finally bring you guys this post: my BIG Vegan Cheese Guide and Review! Over the past few months (and years really) I have been doing extremely intensive research, all in the name of blogging, on the topic of vegan cheese brands. Yes, I dove in cracker first to sniff out and nibble every vegan cheese brand under the sun. All for you guys. OK, and I TOTALLY loved this research project too! Cheese Making Q&A! My detailed reviews are below, but first a bit of cheese chatter. I was able to ask Douglas Meyer of Blöde Kuh a few questions about the cheese-making process, and also tips for DIY-ing cheese at home! Check out his answers..
Q: Me: What do you use as your cheese cultures? How can readers DIY this? A: Douglas: We use a custom blend of cultures (grown on a vegan and non-allergenic medium) to jump-start the fermentation process for our cheese. For DIY makers, haphazardly using cultures is going to be hit and miss and not really worth the effort. We always encourage making rejuvelac (a fermented beverage derived from sprouted grains) for homemade nut cheeses. We always used this when we started making it at home for family and friends, and, after we got the hang of it, it would turn out a tasty product (albeit with different flavor notes) every time. The reason we switched to cultures when we started Blöde Kuh is it’s difficult to keep the potency and flavor notes consistent from batch to batch when using rejuvelac. - Don’t buy cheap grains. Cheap grains are typically difficult to clean and won’t sprout thoroughly, which in turn creates more inconsistency. We really like Alter Eco’s Royal Pearl Quinoa for this job, but choose whatever medium you prefer. - Even with clean grains, you should still rinse them before starting the sprout and change the water several times during the sprouting process. Even the best grains benefit from water changes. We also prefer to use spring water over distilled or filtered water. - After putting the rejuvelac in with the blended cashews, make sure you can check in every hour or so between the 8 hour mark and the 16 hour mark. The window where the cheese is tangy but not fizzy can be as small as two hours. - Cashew source is very important as well. We found that different countries of origin will produce different flavor profiles. For instance, Brazilian cashews, though absurdly delicious, are typically too sweet for this project and the cashew flavor will come through on the back end. - Always remember that the fermentation process is magical. We genuinely believe that your mood, the moods of the people who grew and harvested the ingredients, the air quality, EVERYTHING can affect the process. Talking to the cheese helps. Feeling love, feeling connected to the earth, feeling gratitude… that all factors in. We take this… well, “seriously” isn't the right word, but we do think this is an essential component of the creation process. Q: Me: How do you age vegan cheese without spoiling it? A: Douglas: We use air-tight glass containers to make our cheese and we never see spoilage or contamination. If you consider “over-fermentation” as spoilage as well, make sure the fermentation temperature is steady, keep a close eye on it while fermenting, and make sure you get the product in the fridge as soon as its done, as refrigeration slows the fermentation process. Thank you so much Douglas! Such fascinating info! In a hurry? Here is my quickie guide..
*note: graphic has not been updated to include GoVeggie as a fave for malting vegan cheese! See full review below! And now, onto my BIG Vegan Cheese Review! 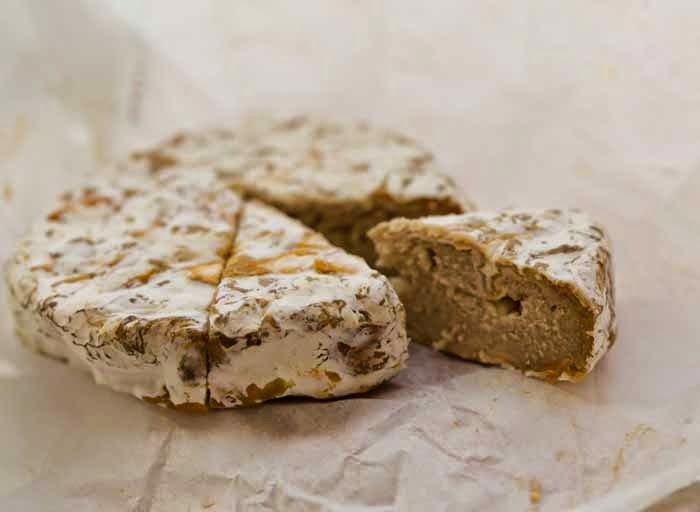 Parmela Creamery Slices and Shreds made from cashews, aged cheese are amazing! We love the flavor and texture and the shreds melt really well. I love the cheddar shreds the best and the pepper jack slices. I found them at Whole Foods. So Delicious Mini Shreds are really awesome for melting and using on veggie tacos and even salads. They also melt pretty well and have great flavor. These are the only "mini shreds" I have seen on the market. Miyokos Kitchen is now in Whole Foods! My fave cheese is the Aged English Smoked Farmhouse. The double cream varieties are good too for spreading, but the smoky, sharp flavors are my preference. Try a few because they are SO GOOD. What is it? Chao slices are vegan slices by Field Roast, the company who also makes amazing vegan sausages and other products. 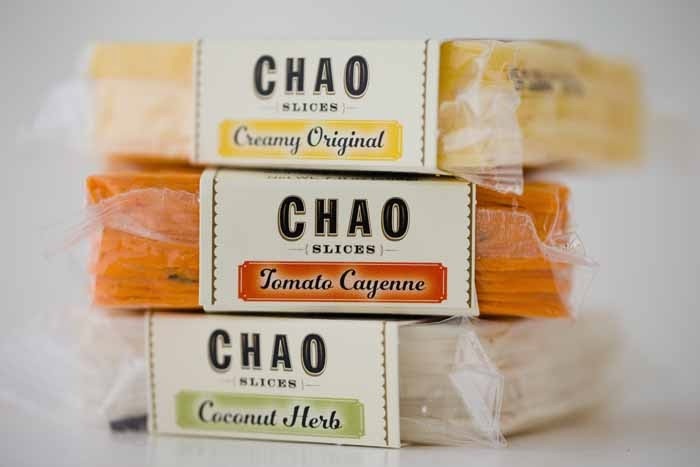 Chao slices are rich and creamy, a non-dairy coconut cheese. They come in three flavors and have a hearty, silky texture. From the Brand: "A rich and creamy non-dairy coconut cheese seasoned with a traditionally fermented soybean curd from Asia." 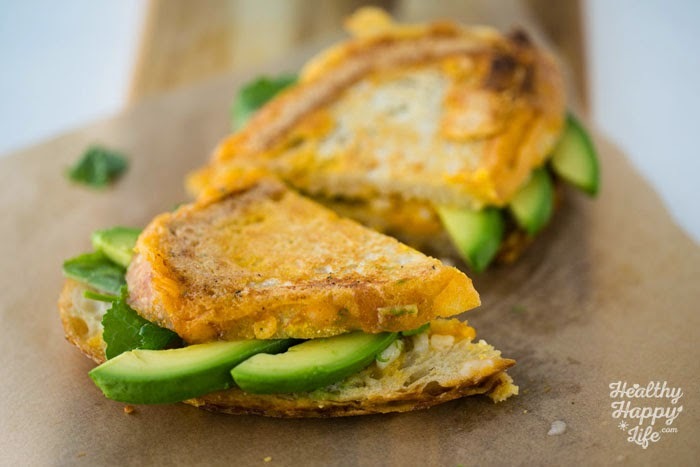 Ingredients: Main ingredients include tofu, potato starch, coconut oil..
Best Recipe Uses: Great for layering in sandwiches (hot and cold), or tearing into bits and adding to salads. I even effectively grated a few slices and folded them into a pasta dish for some amazing added cheezy flavor. Cost: around $7 on VeganEssentials, ten slices per package. I was sent samples and I have not seen them in stores near me yet. Where to Buy: Again, I have not seen in stores near me, but I was told they are coming! This is a new product as of spring 2015. Kathy's Review: I love these slices! I really loved the packaging, look and texture of the slices at first glance. The flavor is mild yet very delicious and cheezy. I tried the slices on both hot and cold sandwiches and loved them. My favorite flavor was the Tomato Cayenne. I thought the creamy coconut was a bit too mild in flavor, I was hoping for a sharper "white cheddar" flavor, but after using this flavor in a pasta dish, and melting it, the flavor bloomed quite nicely! Yet not overpowering. The Good: High quality slices perfect for layering on hot or cold sandwiches, impressive, creative flavors, rich and creamy texture. No funny aftertaste. The Bad: Melting, average. Flavor slightly mild. Chao tomato cayenne up close..
What is it? DrCow is a brand of raw, organic, aged tree nut cheeses. They were one of the very first brands to sell aged cheese. Their cheese comes in small rounds and is wrapped up elegantly to resemble a traditional dairy cheese wrapping. They have a variety of flavors and ingredients. They also have a cream cheese available. The aging process gives the cheese a sophisticated "dairy cheese" personality. From The Brand: "Dr-Cow is a small, certified organic, environmentally conscious company researching and creating innovative artisan foods. Dr-cow was founded in Williamsburg, Brooklyn New York." Ingredients: 100% raw certified organic nuts. Most products are made using cashews as the main ingredients. However they also make a macadamia nut cheese, and one with Brazil nuts. They also use ingredients like hemp, kale and even blue green algae. Flavors: Cashew, Macadamia, Cashew and Brazil Nut, Cashew and Hemp Seeds, Cashew and Dulse, Cashew and Blue Green Algae, Cashew and kale -- all raw aged and organic. Best Recipe Uses: These elegant cheese are best thinly sliced and served on a cheese platter with fruit and crackers, or added over top salads. Where to Buy: You can buy online. I also purchased DrCow in several grocery stores in NYC when I lived there. Kathy's Review: I adore DrCow cheese. I first tried it at Pure Food and Wine in NYC, since they had a DrCow-sourced vegan cheese tasting on their menu. Then I later bought a sampler box. This was the first time I had ever experienced an aged vegan cheese and I was in heaven. And even today, after trying many aged cheeses, DrCow is still one of the brands at the top of my list. Their products are always perfection. The Good: Sophisticated, aged cheese flavor made from top quality raw, organic ingredients. Nut-based, filler free. Texture stays appealing even after sitting out for a while, like at a party. The Bad: Hard to find in stores, high cost. What is it? A gourmet line of vegan, organic, gluten-free "cultured nut products." Miyoko pokes a bit of fun of the fact that by law, in California, she cannot use the word "cheese" to describe her products. Miyoko's is a new brand in the vegan food world, but with a huge factory in Fairfax, an amazing team and a diverse array of creative, artisanal flavors, you are sure to be watching this company grow in the future. 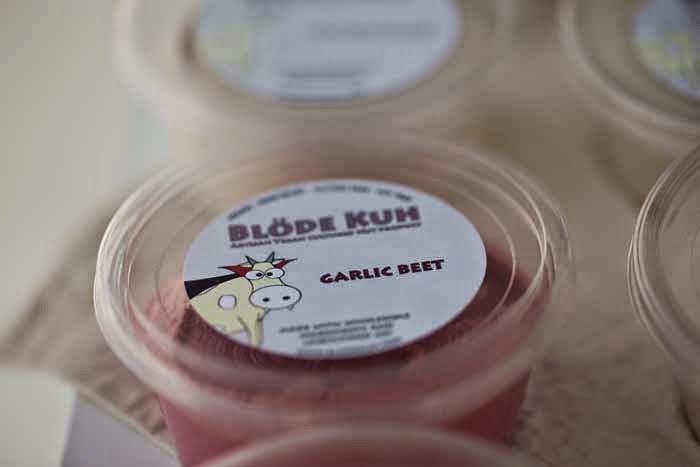 From the Brand: "Our products were created by Miyoko Schinner, who embarked on a mission to recreate the range of flavors and textures she had once enjoyed from dairy cheeses before becoming vegan. Several years of experimentation culminated in the publication of her groundbreaking book, Artisan Vegan Cheese (Book Publishing Co., 2012), which she hoped would inspire others to make their own." Ingredients: Cashew is the nut they use to make their cheese. They have a wide variety of accent ingredients as well. From fig leaves to tomato and more. Flavors: Sooo many flavors. But they are so lovely I must list them all.. Classic Double Cream Chive, Double Cream Sun Dried Tomato, High Sierra Rustic Alpine, Fresh Loire Valley in a Fig Leaf, Mt Vesuvius Black Ash, French Style Winter Truffle, Aged English Sharp Farmhouse, Aged English Smoked Farmhouse, Country Style Herbes de Provence, Double Cream Garlic Herb. Best Recipe Uses: These amazing cheese are best served on a cheese platter with cracker, bread or fruit and nuts. You can also add slices over top salad. You can also spread the softer varieties on toast or on sandwiches. You could even warm these cheeses in a panini, however they will not melt. 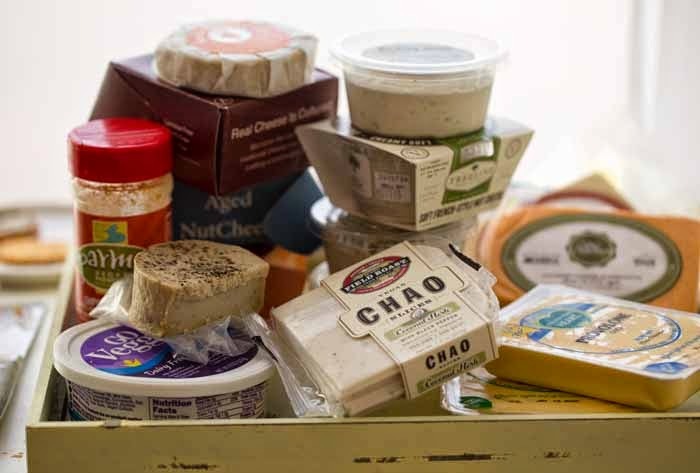 Kathy's Review: I first tasted Miyoko's cheese, or sorry, cultured nut product, when Cobi of Veggietorials brought a giant platter of it to a video shoot we did. I tasted at least seven or so flavors and was blown away. Each flavor was unique, yet remarkable in its own way. These flavors are incredibly creative, sophisticated and elegant. I also love the packaging, which is elegantly wrapped cheeses in a cardboard box. My favorite flavors are the: High Sierra Rustic Alpine, Fresh Loire Valley in a Fig Leaf, Mt Vesuvius Black Ash and Aged English Smoked Farmhouse. Though they are all pretty amazing. The Good: Genius creations that truly mimic all the desirable qualities of dairy cheese, minus the dairy! The Bad: I notice that they get soft quite easily when sitting at room temperature at parties, so try to keep cool if possible. Also not available in stores yet as far as I know. What is it? Daiya Cheese is one of the first vegan cheeses that acquired a reputation for being able to "melt" effectively. Their shreds were a go-to product for cheesy vegan pizzas, melty enchiladas, lasagnas and more. Today, Daiya's product line has expanded into more than just cheese. The make frozen pizzas, cream cheese and even cheesecakes. All vegan. From the Brand: "All Daiya products are free of three of the most common allergens: dairy (casein, whey and lactose), soy and gluten. But what they do contain is creaminess, flavor and savory goodness." Flavors: Three varieties - Blocks, Slices and Shreds. You can see Daiya's website for all the flavors. Best Recipe Uses: The shreds are great for any recipes that require the cheese to melt. Such as pizza, lasagna and more. The blocks are perfect for crumbling over top salads or slicing into cubes for parties. The slices are perfect for sandwiches. You could also grate the blocks if needed. Where to Buy: You can buy Daiya at Whole Foods, Vons, Ralphs and more. (Those are just a few stores in the LA area that carry Daiya) - you can also buy online. 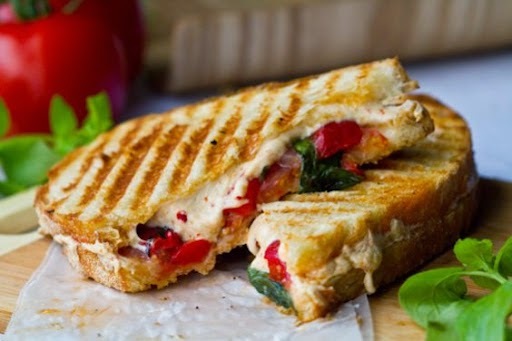 Kathy's Review: I have been a fan of Daiya ever since I first saw how perfectly their shreds melted on this vegan panini. However, I have moved away from Daiya a bit as I have taste tested a few other brands recently. Daiya is still my go-to brand when I NEED the cheese to melt perfectly, but it is not my top choice for flavor. My favorite products are the pepperjack shreds and any of the blocks. I actually find that the blocks have the best flavor out of all the products. My favorite is the jalapeño havarti and smoked gouda blocks. Note: My husband LOVES Daiya. Different strokes for different folks I guess. The Good: Melts perfectly, the newer blocks have amazing flavor. The Bad: Lots of fillers in the ingredients, texture of the melted shreds can be unappealing to some. A few of the flavors are a bit dull. Would I Buy This Again? Yes, but not as often as I used to. Buy It: Buy Daiya Cheese Online! What is it? 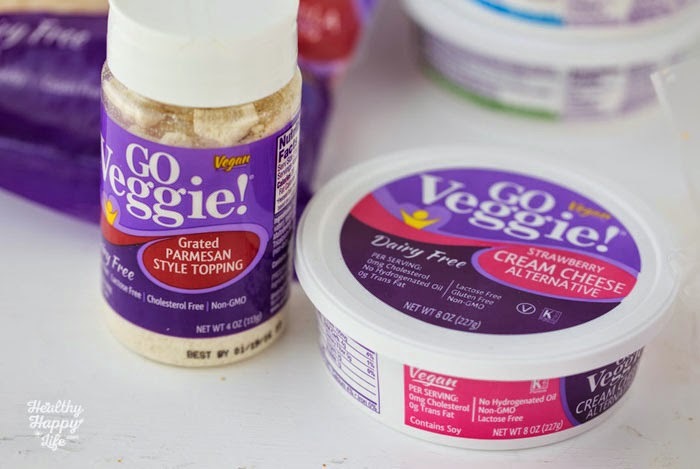 Follow Your Heart, the same company that makes the always-amazing product Vegenaise, has several varieties of vegan cheese. They have their classic line which I have been using for years. And then they have their all new line which is soy free. They also have shreds. The new line (soy free slices and blocks) is what I will be reviewing because I feel it is the best of their products and I was thrilled to try the entire line-up of flavors. From the Brand: "warning: This cheese will redefine your expectations of vegan cheese! These brand new slices and blocks are so amazing, they’ve been called a game changer… make that “hashtag” gamechanger! We guarantee you’ll love them right out of the package!" Best Recipe Uses: Grilled cheese, cold sandwiches, pizza, casseroles and more. 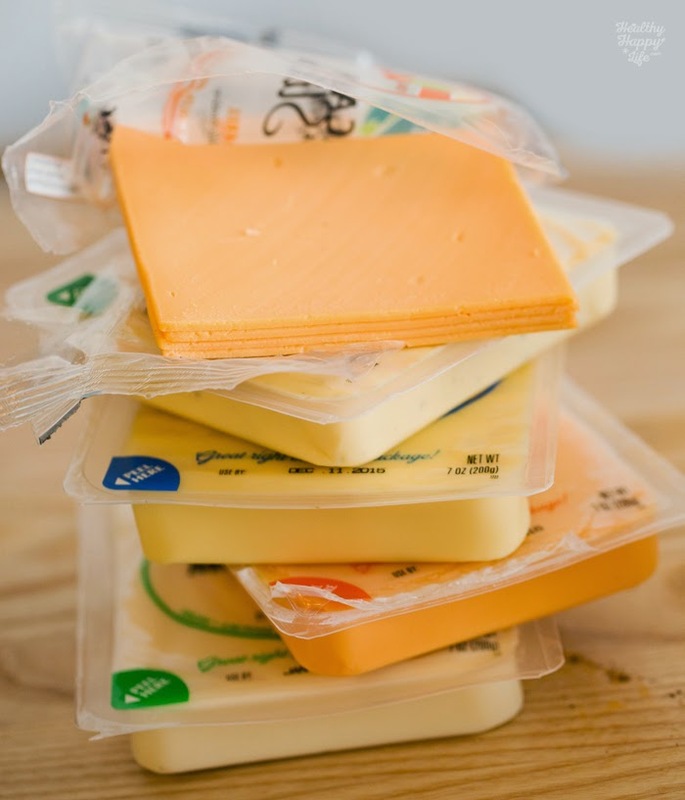 Kathy's Review: I have liked the old line of FYH cheeses for a few years, the flavor was always great but the texture was a bit too soft and it does not melt very well. But when I tried the new slices and blocks I was blown away! I love the flavor, texture and versatility of these cheeses. I even tried them in a grilled cheese and was shocked when they melted perfectly. My favorite flavor is the provolone. LOVE. The Good: Easy to melt, amazing flavor and texture. LOVE these. Probably my new go-to sandwich cheese. The Bad: I wish they had done a cheddar flavor instead of American. What is it? 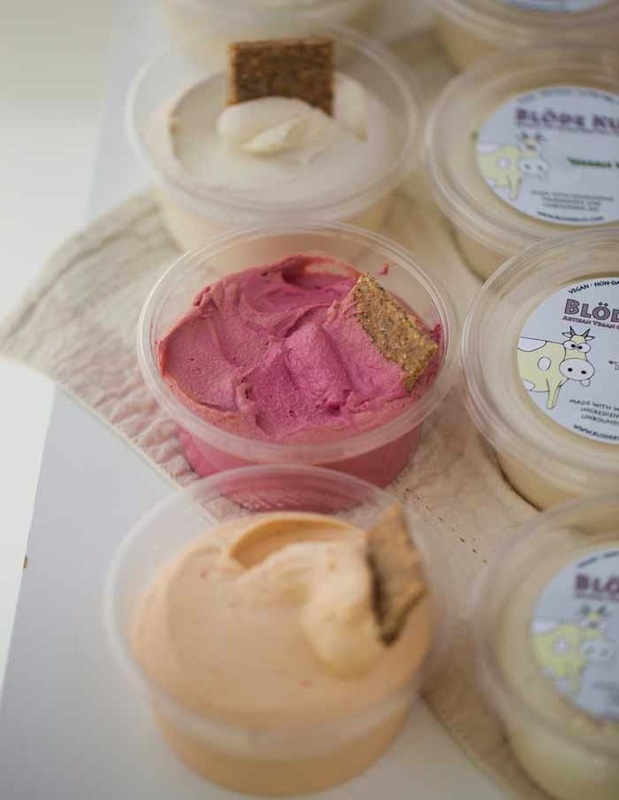 An artisanal, family run vegan cheese and food truck company. They produce a wide variety of flavors and offer delivery. Kathy's Review: I was so excited to try these cheeses because of the unique flavors they make. I was especially excited about the muenster cheese. I was a bit disappointed in the overall texture, it is a bit rubbery and grainy in my opinion. However the flavors are spot on. It is actually quite frustrating because the flavor is really great, but the texture just kind of ruins it for me. 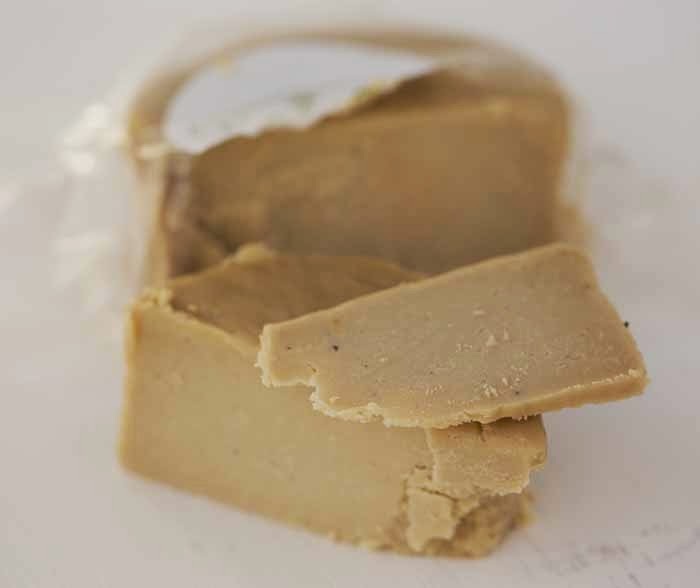 I personally like my vegan cheese to be silky and a bit on the firm side, while this cheese had a texture reminiscent of a firm tofu, with richness. Super flavorful though. The Good: I love these flavors and the ingredients and the fact that they make a muenster cheese! And I love the two amazing individuals who run the company. 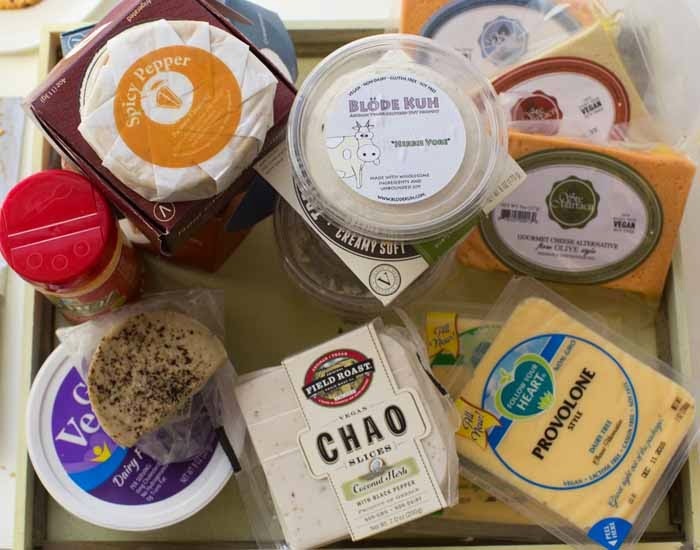 I would encourage true vegan cheese connoisseurs to try it and let me know what you think. The Bad: I wish the texture was a bit silkier and firmer. What is it? Pronounced, BLUE-deh KOO, this vegan tree nut cheese was an exciting discovery for me! 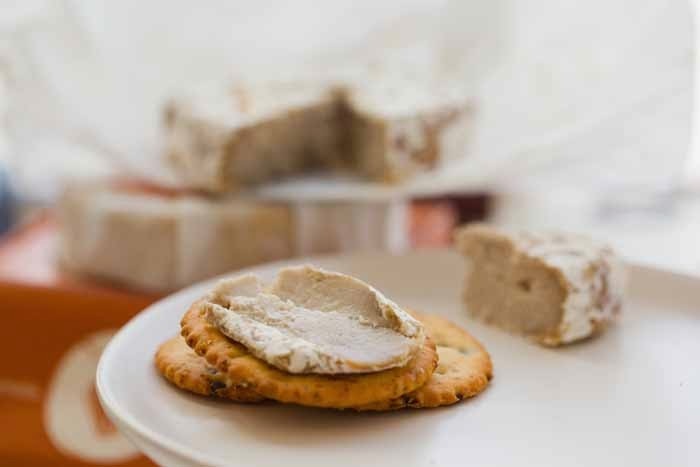 These creamy tree nut cheeses are a bit firmer than a traditional soft cream cheese and pack much more flavor! These cheeses are organic, gluten-free, dairy free and vegan. I tasted a wide variety of flavors, all of which were unique and extremely high quality. Co-founded by Maxi Mueller & Doug Meyer. From the Brand: "All our current flavors have a cashew base, and are cultured with plant-based vegan probiotics. Sourcing organically is important to us, not just because we feel organic is a healthier alternative, but also because organic ingredients almost always taste better than their conventional alternatives." Ingredients: Organic cashews are the base, along with other accents flavors. Flavors: I was sent samples of a wide variety of cheeses! Among them: Herbie-Vore, Okie Smokie, Oma Greti's, The Rad Horse, Truffle Fluff, Sir Racha Cheddar, White Cheddar and a bright pink beet blend. Best Recipe Uses: Dipping and spreading. Sandwiches, crackers, veggie sticks. 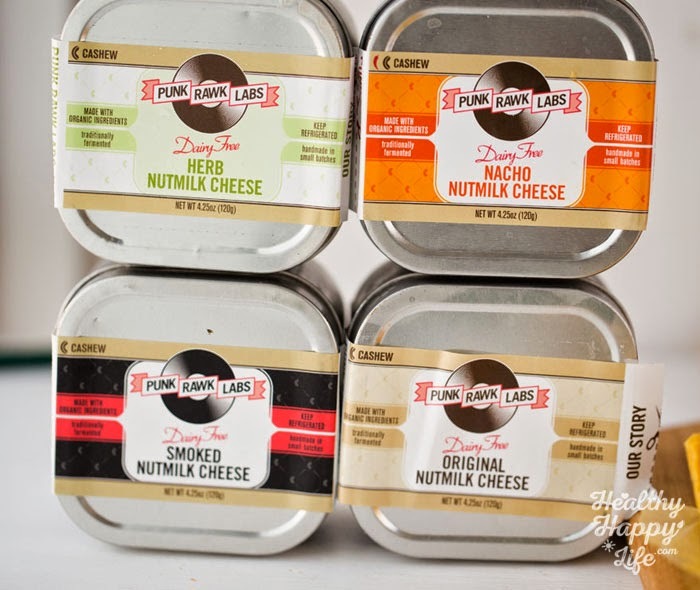 Kathy's Review: I was blown away by the amazing quality and flavors of these cheeses. I tried every single flavor and decided that the Sir Racha was my favorite, though they were all outstanding. True homemade flavor and taste. Plus I was so happy that Doug Meyer was kind enough to answer a few "vegan cheese" questions for me! 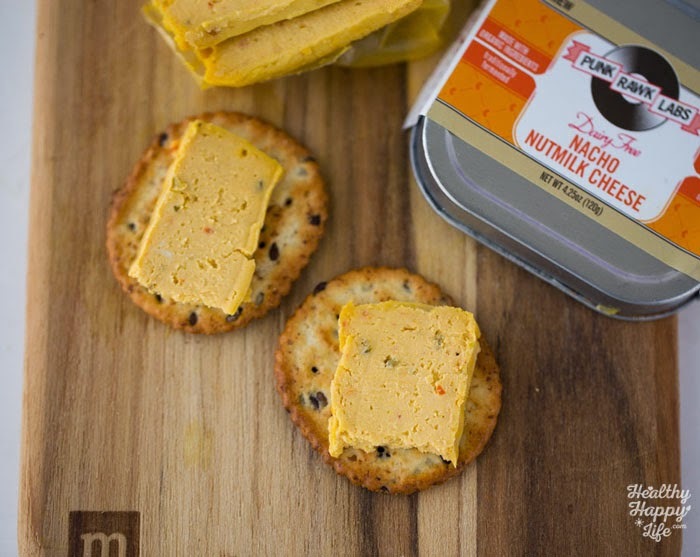 The Good: Quality, flavor, perfection for a spreadable vegan cheese. The Bad: Regional. You have to live in LA to buy, not available online. What is it? Cultured nut cheese. Super high quality cheeses with simple ingredients. Soft to firm texture perfect for parties, spreading, slicing and nibbling. PRL is a woman owned business based in Minnesota. The cheese is handmade using traditional fermenting methods - and using all organic ingredients. 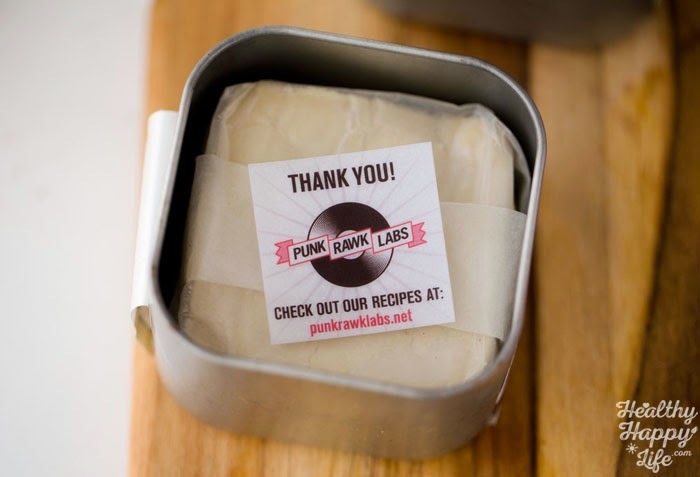 From the Brand: "Punk Rawk Labs is owned and operated by three women: a scientist turned raw chef, a record store owner, and a nutritionist." ... "Our desire is to provide a gourmet dairy free alternative to cheese that actually tastes like cheese. This artisanal nutmilk cheese is handmade in small batches with passion and a love for great food that also makes you feel great. ..... 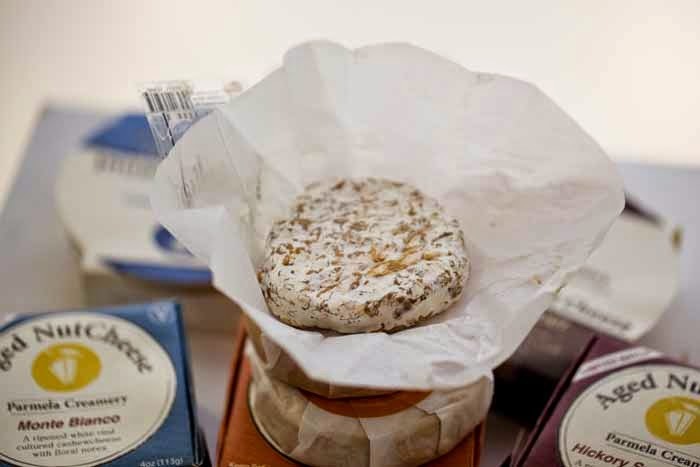 Using a process similar to traditional dairy fermentation, our cheeses are crafted by fermenting nut milks resulting in a smooth texture and authentic umami flavor. Unlike most alternative cheese products on the market, PRL cheese is made using simple and natural organic ingredients free of dairy, gluten and soy. Our cheese base contains only four components: nuts, water, culture, and salt." Kathy's Review: I adore this cheese. I have bought it about three times and every time I taste it I say to myself, "This is one of my favorite vegan cheeses by far!!" But then I get super frustrated because it is often sold out, out of stock or not at local stores. I wish they had an online ordering system. My favorite flavor is the black pepper crusted. Perfectly textured, light and fluffy, while still rich and dense. The black pepper adds loads of perkiness. UPDATE: I recently tried all the flavors and was BLOWN AWAY. I was reminded how much I ADORE this cheese. The texture melts in your moth but is still a nice rustic texture - not too oily or dense. It has a fluffiness that I just love. The flavor is spot on for vegan fermented cheese. A serious must try for every vegan cheese lover! The Good: Amazing flavor, texture and quality. The Bad: Harder to find in stores. 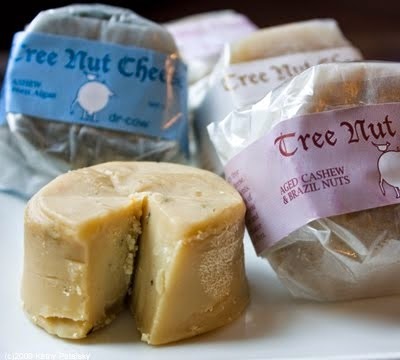 From the Brand: "Artisanal treenut cheeses to rival the best of France and Italy Treeline Cheese is great for lactose intolerant people, vegans and lovers of fine cheese. Treeline Cheese has no lactose, soy or palm oil." Best Recipe Uses: spreading, dipping, nibbling, crumbling over salads. Cheese platters. Where to Buy: I buy mine from Whole Foods, "We are now in over 600 stores - from neighborhood health food stores and co-ops to giant supermarkets all over the continental US"
Kathy's Review: Another one of my favorites! I adore this cheese. My husband calls this his top notch pick, along with DrCow. Both the soft and firm varieties are superb. Top notch in my book too. It has that tangy flavor you crave from a vegan cheese, yet the ingredients are simple and pure. Very elegant packaging as well. Party approved for sure! Show the vegan critics what vegan cheese can taste like. The Good: Superb quality, variety of flavors too! Gourmet and healthy ingredients. The Bad: Not cheap, but then again neither is fancy dairy cheese! I wish they had a few more varieties of the aged cheese. Maybe a sharp cheddar! Buy it: Buy Treeline Online! What is it? 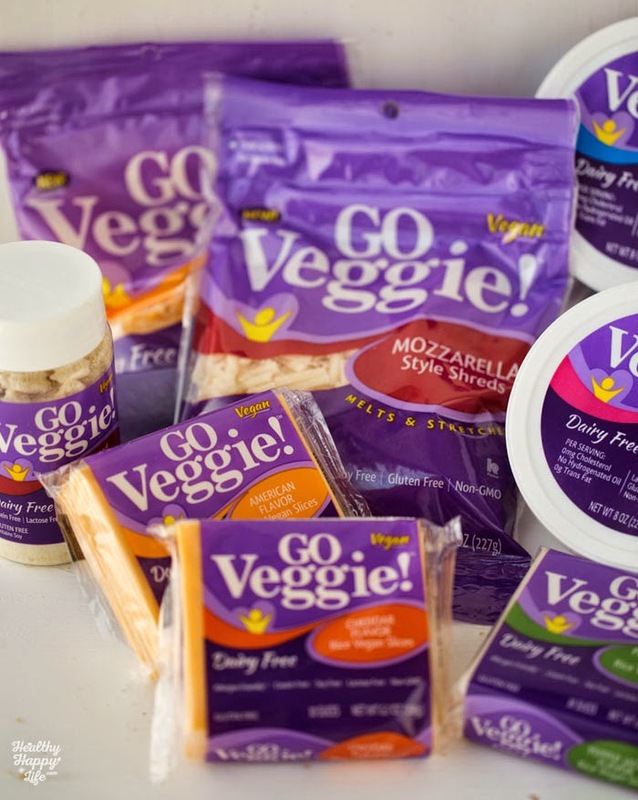 Go Veggie is one of the very first vegan cheese brands out there. They have slices, shreds, sprinkle and even "blissful blocks." They have both "lactose-free" cheeses (aka not vegan because they contain casein) and vegan cheeses. 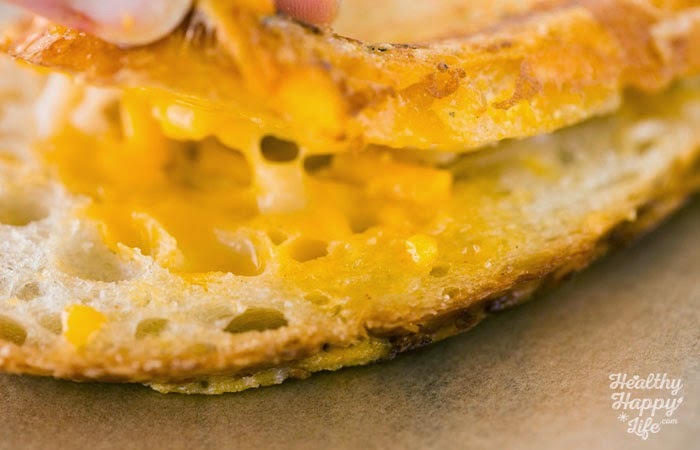 From the Brand: "Not ready to say goodbye to mac-n-cheese, melty grilled cheese, and panini melts? 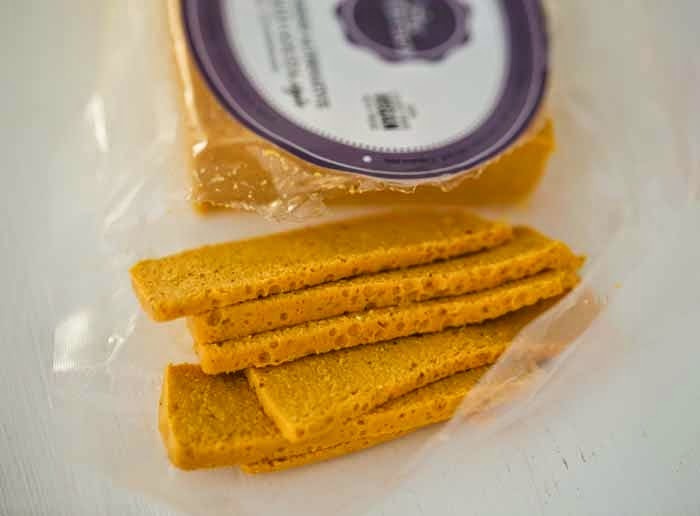 With GO Veggie!® Dairy Free Cheddar Flavor Slices you don’t have to. Because our slices melt, stretch and savor like cheese." Best Recipe Uses: sandwiches -- new shreds are perfect for casseroles, enchiladas, nachos, grilled cheese and other "melty-needed" recipes. Kathy's Review: First Review: I remember buying these "dairy-free" slices years ago when I first went vegan, only to realize that the variety I was buying contained casein, a milk product. I was so frustrated with that. Then I started buying the vegan pepperjack variety. I was thrilled to have a vegan cheese option for my sandwiches, but to be honest I hated the texture and the flavor was just ok. It didn't melt like I hoped it would. Note: I do love their Parmesan sprinkle. UPDATE: I recently gave all the Go Veggie products a try and have a new review. Slices: Sad to say, but I still do not like these slices at all. I do love that they are individually wrapped, but the texture and flavor is just not my favorite. Shreds: I tried these new shreds and LOVE them! They melt super well and have good flavor. They really melt in a flash and have a lovely color and melty tone and texture to them. I tried them in a grilled cheese and they were great! Cream Cheese: I really love the Go Veggie Cream Cheese Alternative. My favorite flavor is the strawberry. Super silky, fluffy and rich. Tastes like a sweet strawberry cream cheese treat. Parmesan: Yup, I still love this vegan Parm product. My husband is obsessed with it. The Good: Vegan cheese option that is widely available. Shreds melt very well and have great flavor. Parm sprinkle is amazing. The Bad: I do not like the slices. Would I Buy This Again? Yes to the shreds and Parm. No to the slices. Buy it: Buy Go Veggie online! What is it? 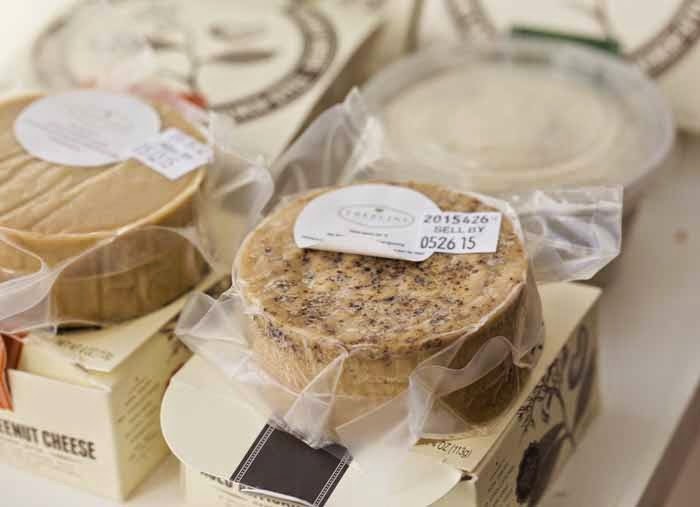 Artisan Nutmilk Cheeses with rich flavors and gourmet appeal. They carry creamy treenut, aged nutmilk and ripened almond milk cheeses. They also make a Parmesan sprinkle in a tiny yellow container. From the Brand: "Philosophy: Use of highest quality plant based ingredients is assumed. Honor heritage of traditional cheese making while crafting a sustainable future. Support sustainable artisan food chain. Develop entire cheese experience, taste, touch, sight smell, to make plant based cheeses enjoyable for all. Supply vegan chefs with competitive advantage. 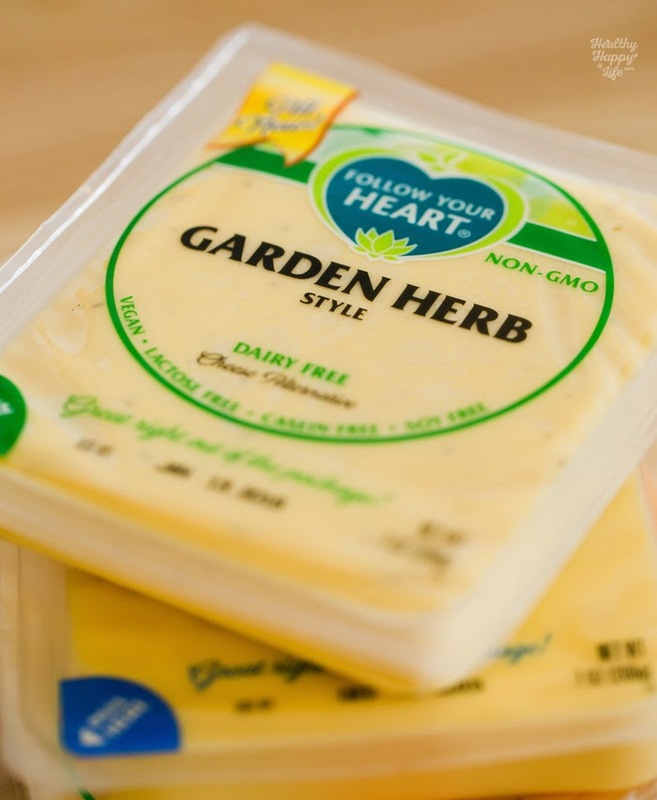 Cheese should be designed to improve heart health"
Ingredients: Nuts and simple natural ingredients. Flavors: Many flavors! Creamy: Original, black pepper, kalamata olive, garlic and chive, sun dried tomato. Aged: Monte Bianco, Hickory Smoked Gorde, Spicy Pepper, Parmela Blue. Best Recipe Uses: Spreading, nibbling, cheese platters, over top salads and veggies. Where to Buy: I have found the creamy cheeses in Whole Foods but I have not seen the aged cheeses. Kathy's Review: I am so impressed by this brand in their scope and creativity with flavors and presentation. When I opened that Monet Bianco I was blown away by how much it looked like Brie cheese. The flavors and textures are all spot on. The Hickory Smoked Gorde was the first flavor I tried, after buying it at a local grocery store. I LOVED it. I was so impressed. It was softer and silkier that I was used to, but the flavor was so amazing it all made sense. When I received my sampler box, I tried all the flavors and I actually found the Monte Bianco aged cheese to be a bit saltier than I am used to, but still flavorful with perfect texture. I love the packaging too. 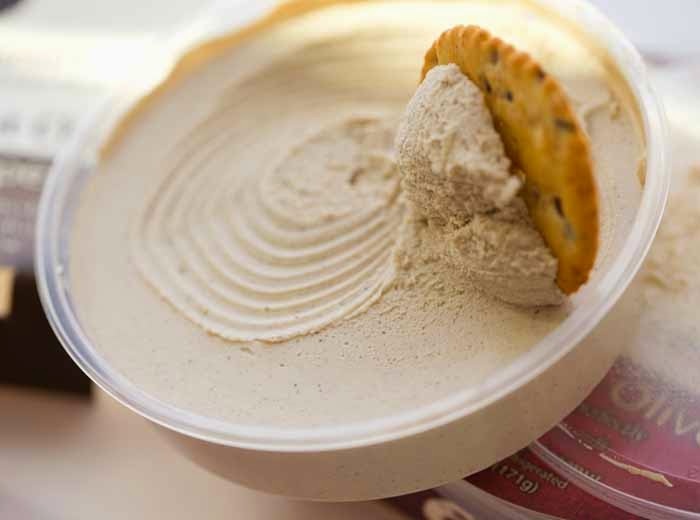 The creamy varieties are perfect for spreading and snacking. My favorite flavors are the: spicy pepper and Hickory Smoked Gorde aged and black pepper creamy. OH! And Parmela makes an awesome vegan Parmesan sprinkle!! The Good: Bold flavors and rich, appealing textures. In love with the Hickory Smoked Gorde. The Bad: The Monet Bianco was a bit overly salty for me, not sure why. The aged varieties do not seen to be widely available in stores. 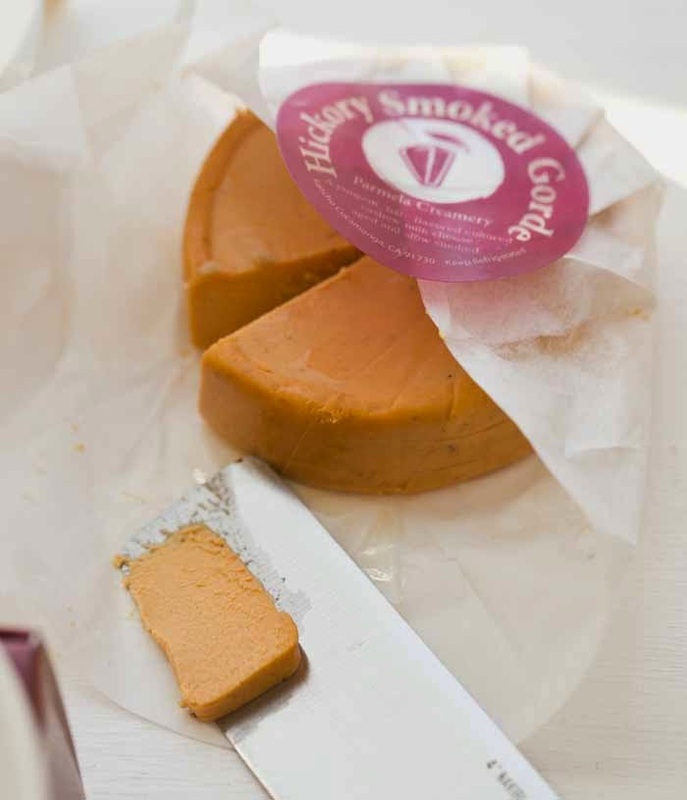 My fave the Hickory Smoky Gorde..
What is it? The first vegan cheese brand to be placed exclusively in the Whole Foods cheese department. Made using simple ingredients and classic techniques. The team behind this brand includes superstar vegan chef Tal Ronnen. From the Brand: "From the beginning, we were adamant that our process follow the time-honored techniques of traditional artisanal dairy cheese-making. This meant using only a short list of the best ingredients, superior French equipment in our aging rooms, and going through a lengthy and painstaking process of trial and error rather than taking shortcuts." Ingredients: Nut milk, cultures, enzymes and salt. Flavors: Soft Fresh Original, Soft Fresh Dill and Chive and Soft Ripened. Best Recipe Uses: Cheese platters, over top salads or veggie dishes. 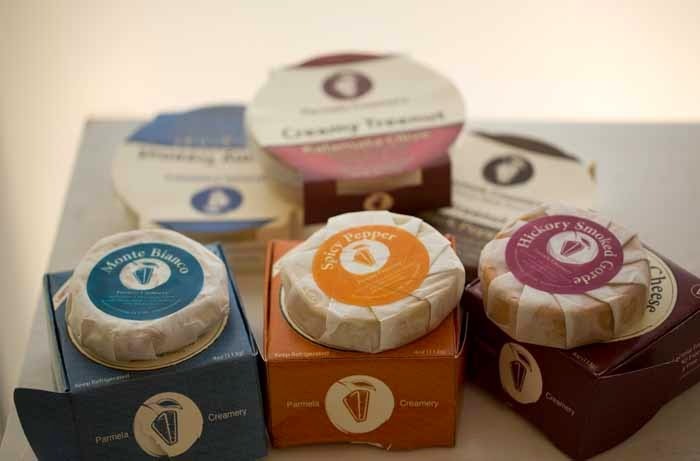 Kathy's Review: Beautifully packaged and incredibly high quality, these cheeses impressed me a lot! Well, the soft versions that is. You see, I have NEVER been able to spot the ripened cheese in stock. So I have only tried the fresh varieties. The flavor is very mellow and pure. The texture has a spongy nature that slices beautifully and is smooth to taste. The flavor of the fresh cheese is much less intense than anything "aged" I have tasted. I am really dying to try the aged variety because I have a feeling it is fantastic. The Good: Top quality vegan cheese with gorgeous gourmet presentation. Company is backed by incredibly talented people like Tal Ronnen. The Bad: Hard to find, must buy in Whole Foods. Only pic I have from my Kite Hill taste tests a few months ago..
What is it? A new vegan cheese company that was featured on Shark Tank! I was so excited to see this product in Whole Foods. 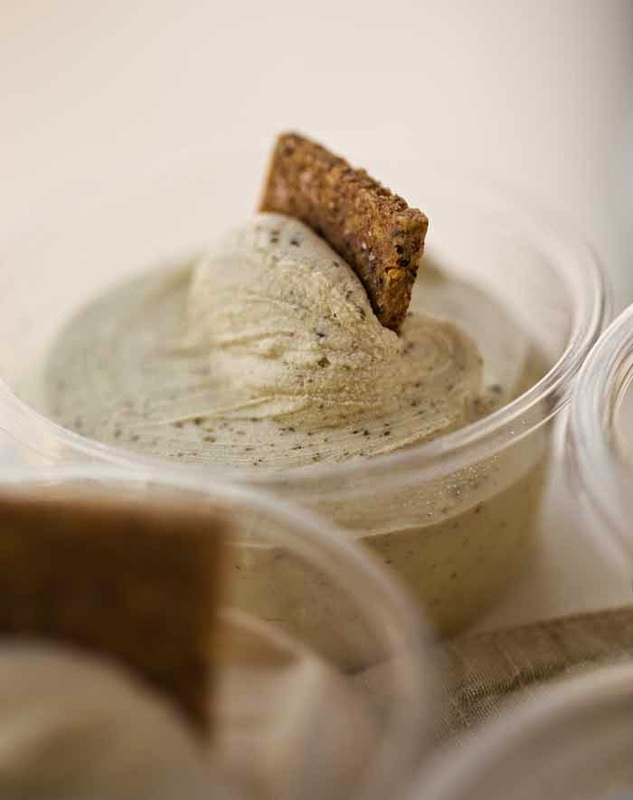 They carry two varieties, a creamy chia cheeze and Ne Chèvre which is a firmer spreadable cheeze. 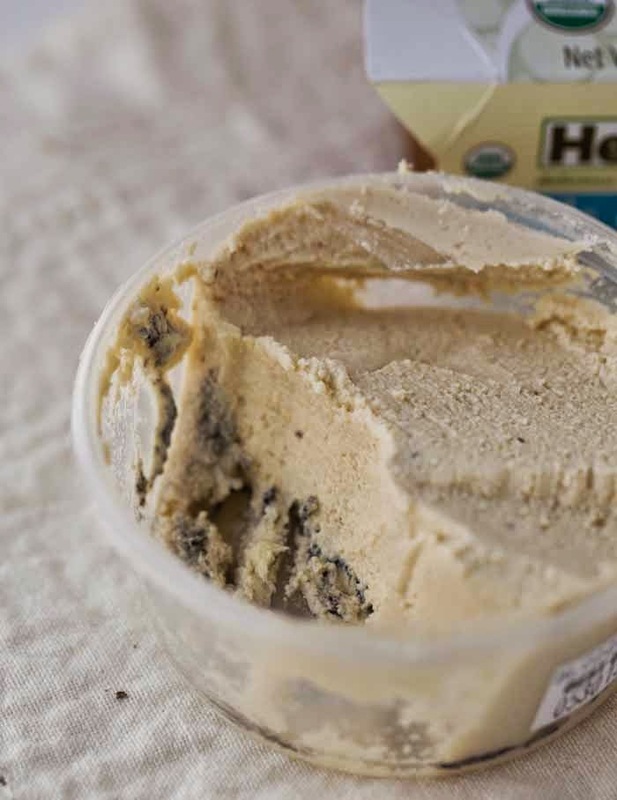 From the Brand: "Heidi Ho is the future of cheese. We are a mission-driven company which aims to be the cheese that creates the change." 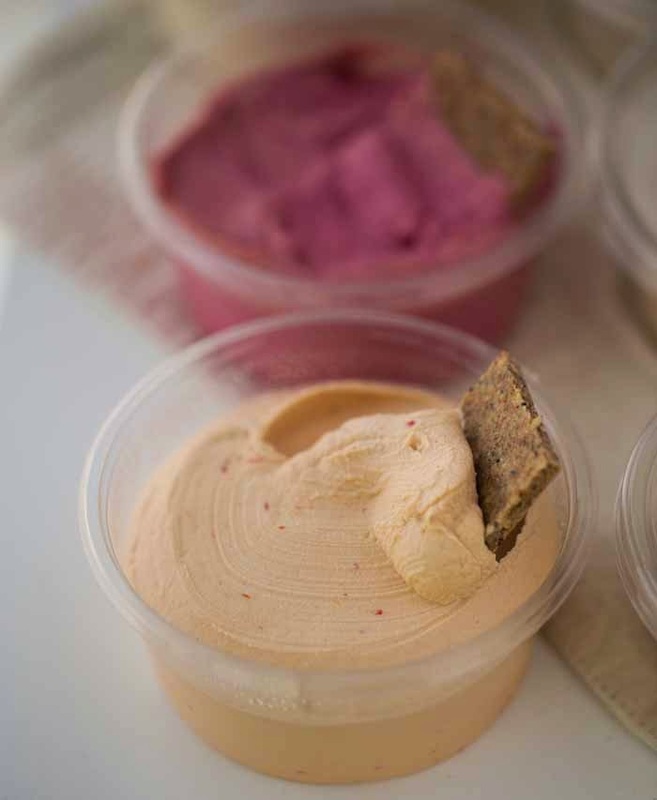 Ingredients: Cashews, live cultures and accent ingredients..
Best Recipe Uses: Spreadable, dippable. Kathy's Review: I stumbled upon this cheese in the Black Lava flavor at Whole Foods one day. I have never actually seen their Shark Tank episode, even though I am an avid Tank watcher! I tried the cheese and loved it! Super flavorful and high quality. Creamy with a nutty, interesting texture. And I loved the black layer of "lava" aka black lava salt. Now I need to find and try that "chia cheeze" that looks super interesting. The Good: Wonderful flavor and texture. The Bad: I wish they had a firm aged variety. What is it? 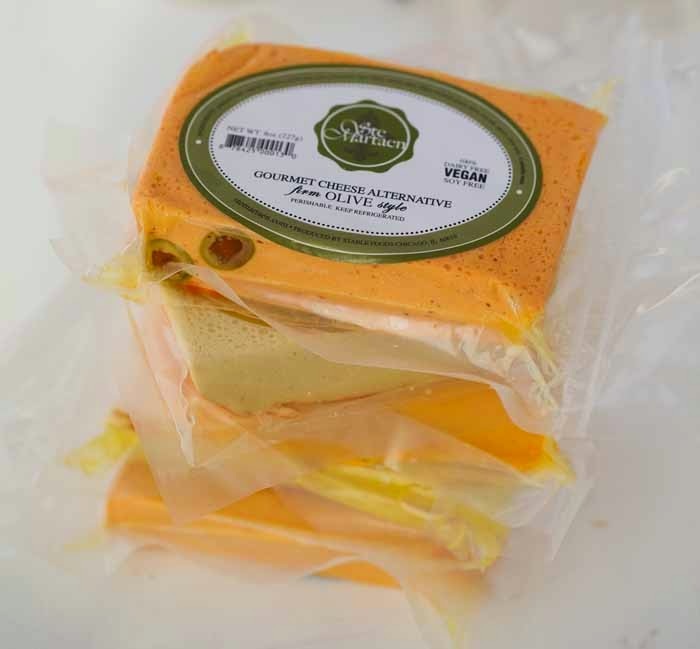 A unique vegan cheese that comes in a tube and drizzles out in a "cheeze whiz" or velveeta-ish texture. Super silky and lively flavors. 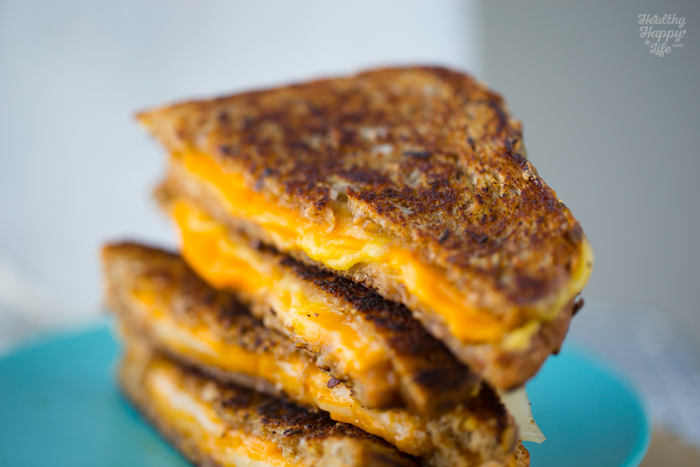 Melts and gets all ooey gooey like a yummy cheese sauce should! Made by Chicago Vegan Foods, which also makes Dandies vegan marshmallows. From the Brand: "Teese Vegan Cheese is a low-fat dairy- free cheese alternative that delivers authentic taste, texture, melt and stretch. Our unique packaging really stands out and gives Teese a longer shelf life than our competitors." Ingredients: tapioca starch, coconut oil, pea protein and more with fillers. 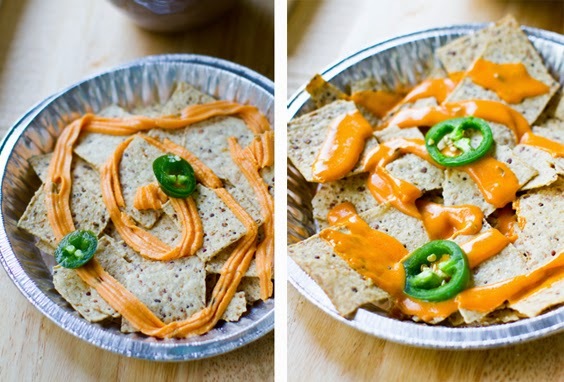 Best Recipe Uses: Nachos, enchilads, pizza, quesadillas, anything that you want to be ooey gooey cheesy and melty. 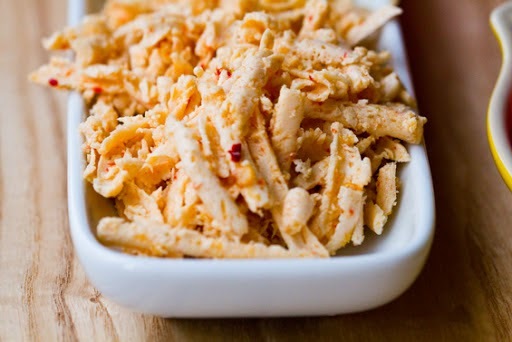 Kathy's Review: I love Teese as a super nostalgic version of vegan cheese. You know, the kind that is bright orange and loaded with flavor. Even though the ingredients may not be my favorite, for a once in a while nacho-fest, this cheese is really fun. 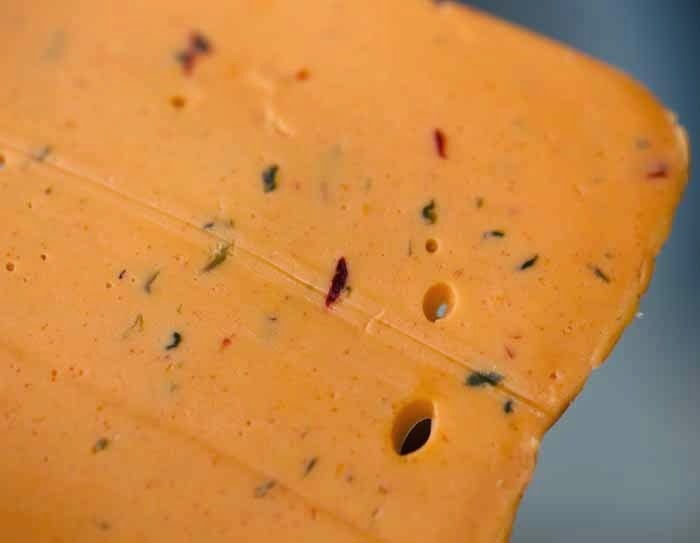 The Good: Fun and flavorful bright orange, melty cheese, more of a thick sauce in texture. The Bad: Lots of fillers in the ingredients. Buy it: Buy Teese Online! before and after teese melts .. used oven..
What is it? A vegan version of Parmesan sprinkle that comes in a wide variety of flavors. Made using whole foods like walnuts and sunflower seeds. From the Brand: "Parma! boosts your savory foods to the next level of yum! Sprinkle Parma! (or pour) on popcorn, pizza, pasta, ​soup, and salad.​​ It is also great on sandwiches, ​tortillas, beans, avocado, lightly steamed ​veggies, grains, ​and most savory food. Parma! is an excellent food source of Omega 3's, B vitamins, including B12, protein, and trace minerals. Parma! is very low in sodium and it is considered a super food." Ingredients: Raw organic walnuts, sunflowers seeds, nutritional yeast, spices, salt..
Best Recipe Uses: Sprinkle over top pasta, pizza, just about anything! Where to Buy: Online at Vegan Essentials or in many specialty grocery stores. Kathy's Review: I love this stuff! Which is why I had to add it to this list as a "sprinkle" option. Amazing flavor and healthy, simple ingredients. I love the Chipotle Cayenne best for a spicy kick. The Good: My fave sprinkle cheese by far! The Bad: Every time I buy this I think, hmm I could totally make this myself by grinding similar ingredients in my Vitamix. (I switch on and off between Parma and DIY sprinkle cheese. Bottom Line: Vegan Cheese Rocks. It seriously is KILLING IT on today's store shelves. So if anyone tells you they cannot go vegan because they would miss cheese. Send them here. And case closed. What vegan cheese is YOUR favorite? disclosure: I was sent free samples of these cheese by most of the brands, but this is in NO WAY a paid post. :) If you are a vegan cheese brand and want to be included or have new products - contact me! Happy to update this post.